I'm eating breakfast and surfing the net, and I hear a sound scraping across the screen in my window (which is open, 'cuz it's still fairly warm here...). I look to my right and jump, startled. 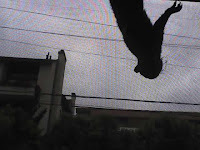 There's a squirrel hanging upside down underneath the eave of the roof, attempting to crawl down the screen of my window. Said screen is very old and semi-precarious. After scaring me, the squirrel thinks better of his plan and withdraws. I am cursing myself--thinking this is the perfect moment that one should own a good digital camera. Squirrel makes another attempt, I frantically go to retrieve my cell phone with the crappy built-in digital camera. Squirrel once again withdraws. I sigh. Opportunity lost. Then I come up with a plan: I smear a bit of peanut butter (hey, it'd work for me!) on the window screen hoping the nut smell (squirrels like nuts, right?) would draw him back. Then I wait, cell phone poised to strike. I think better of my plan and go to wet down a paper towel and try to remove the peanut butter. As I start to wipe it away, the screen starts to dislodge--nearly falling out (along with my fan!) onto the ground two stories below. I grab the screen and attempt to reattach it. And while I'm doing this, who should reappear but THE SQUIRREL!!! 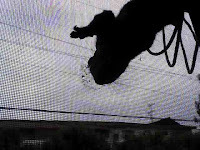 As I'm trying to keep the screen in place, he's LICKING the peanut butter off of it (see, I TOLD you it would work!)!!! He was a pretty cheeky fellow. Didn't seem to mind me at all as I held onto the screen with one hand and used the other to reach down and retrieve my cell phone and snap a picture. I was worried that if I let the screen drop, he come right through the window demanding more peanut butter (I know I would!). So I shooed him off while I struggled with the screen. I even closed the window to make sure he didn't perform a sneak attack. A man is walking down a street and he sees an acorn in the middle of the road. He walks over and bends down to pick it up. Suddenly, a car is bearing down on him very quickly. He freezes. Frantically, he's thinking, "Should I go to the right? Should I go to the left?" and as he's trying to figure out what to do, he notices the car is being driven by a SQUIRREL! And as the car swerves by him, the squirrel yells out the window: "It's not so easy, is it?!!!" This is glorious! Who knew the squirrels in So Cal were so social... and aggressive! I was afraid he leap right through the window and start rifling through my cupboards for food!